This religious tapestry "Mater Dolorosa" shows the Virgin Mary. Also meaning Our Lady of Sorrows, this aspect of Mary is a key focal point in much of catholic art. There are 7 different sorrows of the Virgin, and here we see her in a blue garment, with a radiant beam of golden halo behind her head. This indicates her holy spirit and aura despite her lament. 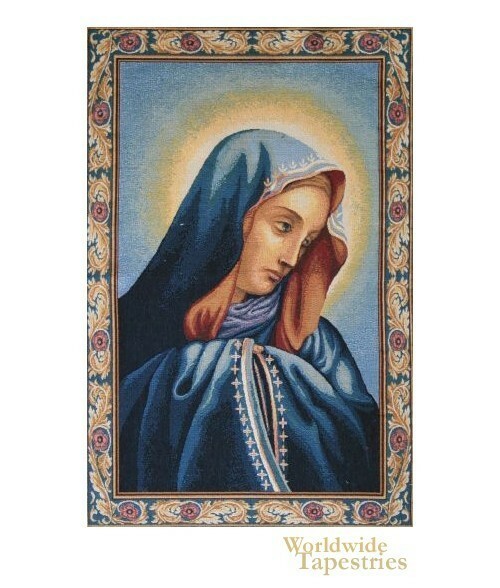 This religious tapestry "Mater Dolorosa" is lined and has a tunnel for easy hanging.